The painting "Creative Splendor" centers on a portrait of the good shepherd Jesus Christ (Psalm 23) as the light and life of all creation. 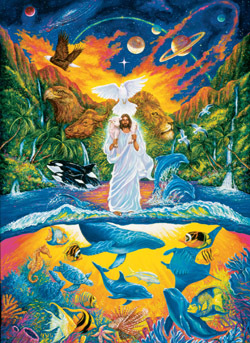 The many aspects of creation all speak to the glory, truth and love of God the Father, God the Son and God the Holy Spirit. The design and subject matter depict a segment of the Lord's magnificent creative splendor. The eagle, ox, dove, lion and lamb all have symbolic importance in scripture and are included to illustrate attributes of Christ. A parallel of these attributes is found in the Old Testament in the first chapter of the book of Ezekiel and in the New Testament in Revelation chapter four. There are four living creatures whose appearances exhibit the same portrait of character.